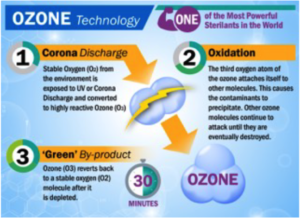 Inside an Ozone Generator – Ozotech, Inc.
An ozone generator produces ozone by passing oxygen or dry air through a high voltage electrical field or corona. The O2 bond is split, freeing oxygen atoms (O1) to rapidly collide with O2 molecules to form O3. Adjusting the applied voltage, frequency or air flow rate affects ozone production. Likewise, the concentration produced is also affected by dew point and temperature of the feed gas. Ozone is usually measured in ppm (parts per million), g/h (grams per hour) or weight percent. The range of applied concentrations ranges from 1 to 5 weight percent in air and from 6 to 14 weight percent in oxygen. Temperature and humidity play a large role in how much ozone is being produced. Any ozone generator will produce less than 50% its nominal capacity if operated with humid air rather than very dry air. Ozone cannot be stored and transported like other industrial gases because it quickly decays into diatomic oxygen, and must therefore be produced on site. At production capacities higher than 20 kg per hour, a gas/water tube heat-exchanger may be utilized as ground electrode and assembled with tubular high-voltage electrodes on the gas-side. The range of typical gas pressures is around 2 bar absolute in oxygen and 3 bar absolute in air. Several megawatts of electrical power may be installed in large facilities, applied as one phase AC current at 50 to 8000 Hz and peak voltages between 3,000 and 20,000 volts. Applied voltage is usually inversely related to the applied frequency. Because of the high reactivity of ozone, only few materials may be used like stainless steel (quality 316L), titanium,aluminium (as long as no moisture is present), glass, polytetrafluorethylene, or polyvinylidene fluoride. Viton may be used with the restriction of constant mechanical forces and absence of humidity (humidity limitations apply depending on the formulation). Hypalon may be used with the restriction that no water come in contact with it, except for normal atmospheric levels. Embrittlement or shrinkage is the common mode of failure of elastomers with exposure to ozone. Ozone cracking is the common mode of failure of elastomer seals like O-rings. Silicone rubbers are usually adequate for use as gaskets in ozone concentrations below 1 wt%, such as in equipment for accelerated aging of rubber samples.